Grand Canyon University was first founded by Southern Baptists in 1949 to provide faith-based instruction in the West. After financial troubles, the school was sold to Significant Education LLC in 2004 and became the country’s first for-profit Christian college. 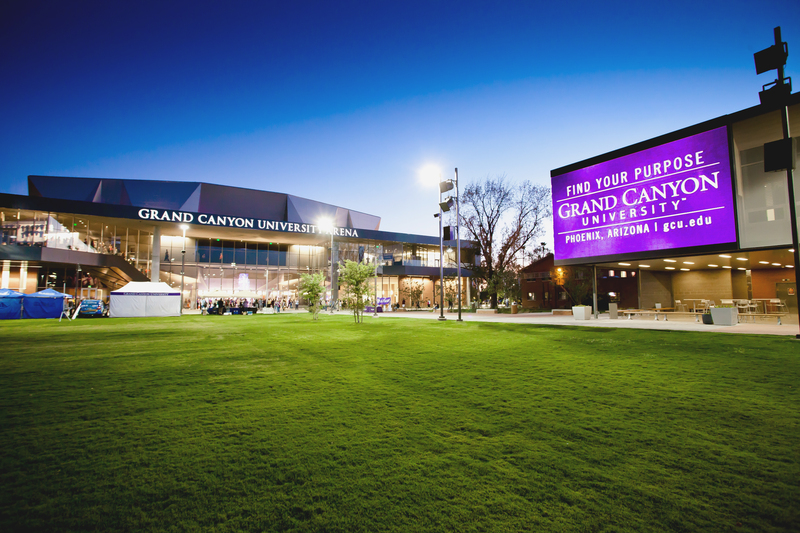 Grand Canyon University is an accredited private for-profit metropolitan institution enrolling more than 75,200 students overall. Around 14,500 of these students attend classes on GCU’s 100-acre urban campus on Camelback Road in Phoenix, the capital of Arizona. The remainder study off-campus in Tucson, Albuquerque, Tempe, or fully online. Rooted in Christian values, Grand Canyon University offers over 150 flexible degree programs across eight colleges. The Carnegie Foundation for the Advancement of Teaching has classified GCU as a research university with “moderate research activity.” Forbes magazine ranked Grand Canyon University the #2 best small company in America with five-year annual EPS growth of 236 percent. In Fortune magazine, GCU was recognized in the top five online schools for entrepreneurs. The U.S. News recently honored GCU for the nation’s 63rd best online bachelor’s programs. After undergoing a $200 million expansion, Grand Canyon University was selected the 10th top online Christian university by BestSchools.org. GCU is also proudly the only for-profit institution in the United States that’s welcomed in NCAA Division I athletics. Last reaffirmed in 2007, Grand Canyon University has been accredited by the Higher Learning Commission of the North Central Association (HLC-NCA). This regional accreditation is approved by the Council for Higher Education Accreditation (CHEA). GCU is properly licensed by the Arizona State Board for Private Post-Secondary Education (PPSE). Several online programs have earned specialized accreditations. For instance, nursing degrees align with the Commission on Collegiate Nursing Education (CCNE). Health science programs meet the standards of the Commission on Accreditation of Athletic Training Education (CAATE). The College of Education is also recognized by the Arizona Department of Education for teacher certification. Even though it’s a for-profit online school, Grand Canyon University has selective admissions policies with an average acceptance rate of 54 percent. For online master’s programs, qualified applicants must already hold a four-year undergraduate degree from an accredited college or university. Graduate students should carry a minimum collegiate GPA of 2.8 or higher. If GPA requirements aren’t met, satisfactory graduate entrance exam scores can expand eligibility. Applicants must score at least 500 on the GMAT or 300 on the GRE (Verbal/Quantitative). Any graduates applying to the non-licensure special education track must possess valid teaching certification and passing Praxis scores. International students with F-1 visas must also score at least 61 on the Internet-based TOEFL. Full-time traditional students attending Grand Canyon University on-campus are charged $8,250 per block. Traditional daytime graduates studying at the West Phoenix location pay $390 per credit hour. However, online GCU programs follow a different tuition structure. Online master’s programs in the College of Education cost $515 per credit hour. Continuing education for teachers in certificate programs will cost $150 per credit. For instance, students pursuing the 39-credit Online Master of Education in Special Education must afford $20,085 total. Online doctoral education programs come with the price tag of $640 for every credit. There’s an active duty military discount of $400 per online credit. Around 70 percent of full-time GCU students receive financial aid. Graduate students can borrow Federal Direct Unsubsidized or Federal Direct Grad PLUS loans at below-average interest rates. Private/alternative loans are accepted. Certain online education majors qualify for the Federal Teacher Education Assistance for College and Higher Education (TEACH) Grant. In-state residents should apply for the Arizona Post-Secondary Education Grant (PEG) or Special Leveraging Educational Assistance Partnership (SLEAP). There’s also the Grand Canyon State University Grant and Phi Theta Kappa Grant for $1,000 each. Military tuition benefits are available via the Yellow Ribbon program. Many scholarships are awarded, including the Direct State Scholarship, Indirect Start Scholarship, Canyon Christian Schools Consortium Scholarship, and University Foundation Scholarships. Delivered in convenient six-week online sessions, the M.Ed. in Special Education program at GCU expands teachers’ pedagogical skills for planning and adapting learning for students with disabilities in an inclusive classroom. Certified teachers can follow an accelerated 39-credit track, but there’s also a 47-credit initial licensure track with student teaching. Courses will explore language development, IEP development, teacher collaboration, learning assessment, mild to moderate disabilities, and math instruction. Graduates are well-prepared to support exceptional students in grades K-12. Featuring 32 credits, the online M.A. in Gifted Education program at Grand Canyon University is designed to equip special education teachers with the strategies to nurture gifted children academically, mentally, and emotionally. Aligned with NAGC standards, the curriculum includes courses on brain-based learning, educational research, instructional methods, talent development, gifted programming, and social-emotional health. The online program consists of six-week sessions for flexible start dates year-round. Only currently licensed K-12 teachers with one year of teaching experience can apply. The M.A. in Autism Spectrum Disorders (ASD) program is available 100 percent online for licensed special educators to deepen their knowledge of neurological development in children diagnosed with autism. The 32-credit curriculum includes courses on brain-based learning, applied behavior analysis, ethics, special education leadership, instructional planning, life skills training, assistive technology, and communication strategies. ASD specialists culminate their degree with a capstone portfolio project. Graduates of Grand Canyon University can work with autistic children in K-12 schools, social service agencies, childcare centers, nonprofits, and more.